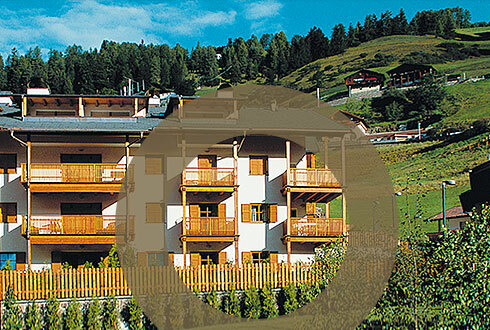 The apartment is situated at the entrance of S. Cristina, in a very sunny position, on the first floor of a residence, only few meters from the ski bus stop. The ski bus will take you directly into the centre or to the slopes. 1 double room with TV and safe with the access in the garden of 50mq. 1 completely furnished kitchen with dishwasher, fridge, oven and a balcony. 1 bathroom with WC, bathtub and washing machine. The rental price is weekly and includes gas, electricity, eating and taxes are included. Bedlinen and towels are provided for. Also included in the price there is the use of the swimming pool, the sauna, the Kneippbath and the Jacuzzi in the nearby Hotel Bel Mont (just during the opening of the hotel). The apartment is situated at the entrance of S. Cristina, in a very sunny position, on the first floor of a residence.